When speaking of influences, one name that is echoed by carvers throughout years of this magazine is, of course, Ian Norbury. World-renowned for his incredible figurative work, his idiosyncratic style is instantly recognisable. 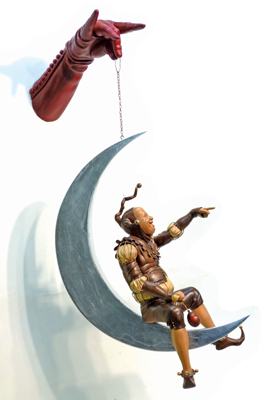 His figures inhabit a gloriously eccentric, dreamlike world of jesters and fools, legends and icons laced with classical, mythical and historical allusions, satire and symbolism. Sometimes comic, often surreal and always strangely beguiling, the realism of his sculptures' anatomy, clothing and faces is truly dumbfounding: "I swear it looks as though he has shrunk real humans down to size," said Donna Menke. 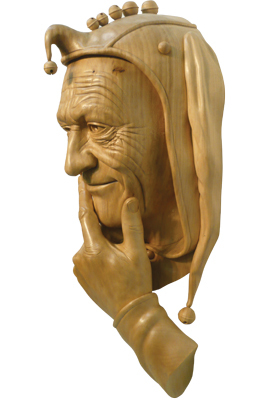 But so much more than technical virtuosity, Ian Norbury has the rare ability to capture the nuances of human nature in wood - his carvings are real, living characters that we can identify with. His latest collection, Paradise of Fools, depicts figures who embody the notion of folly in various guises; be it Pandora, who released all the evils of the world in the Greek myth; or 'The Bureaucrat', a scornful jobsworth in jester's dress, set on a mission to thwart the dreams of the common man. â€œI was drawn to folly by reading In Praise of Folly by Erasmus and The Rubaiyat of Omar Khayyam, where foolish aspects of humanity are depicted with vicious accuracy,â€ he says. Paradise of Fools follows the history of folly "from the days of creation, through ancient mythology and folklore to the perverse foolishness of the 21st century's 'enlightenedâ' mankind." 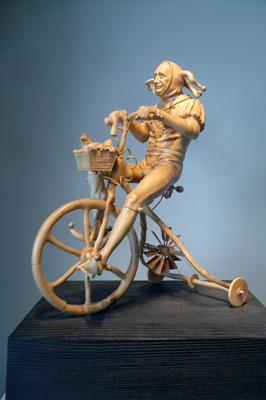 Followers of Ian Norbury's work will be familiar with his long-held interest in professional fools: "A fascination with the activities of medieval jesters and clowns which could appall our 'liberated society'." as he describes it. 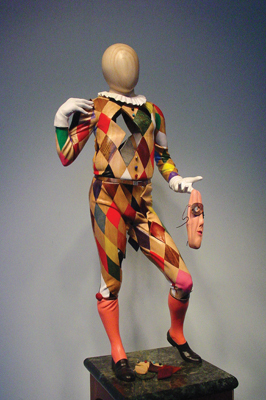 Paradise of Fools, as you might expect, includes several characters in Norbury's signature jester's attire. 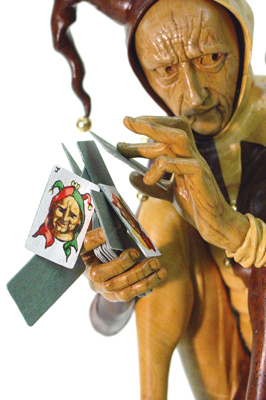 'Another Cabinet Reshuffle' depicts a jester clumsily shuffling a pack of cards: "The Prime Minister reshuffles his pack of ministerial cards, but they are all clowns." The origins of 'The Lord of Misrule' lie in the Roman midwinter festivals of Kalends and Saturnalia when, for a short while, masters and slaves would change places and a mock king ruled over a topsy-turvy world. 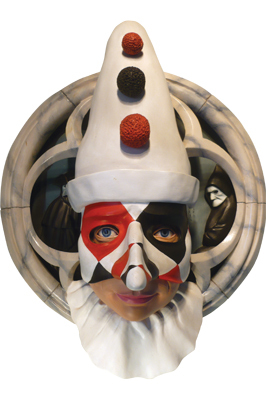 A recurrent feature of his work, Norbury's harlequin costumes are decorated with a complex, coloured diamond pattern incorporating the natural creases and folds of clothing. This is achieved through a meticulous process in which each diamond is inlaid separately. He first creates a template using lead sheet around 3mm thick or, for a deep corner, almost paper-thin. The lead is cut into the shape of the diamond and stuck onto the intended area using a tiny amount of cyanoacrylate (CA) glue. He then cuts into the wood around the template's edge before removing it. A recess is cut into the wood using burrs and small gouges, and the wooden inlay is cut using the lead template. The bottom edge of the inlay is chamfered until it will enter the socket, and pushed in with carbon paper in between to mark it. He then cuts away the marks, repeating until the inlay fits, and finally carves in the folds. A harlequin costume might have 250-300 diamonds, so it's no swift task. 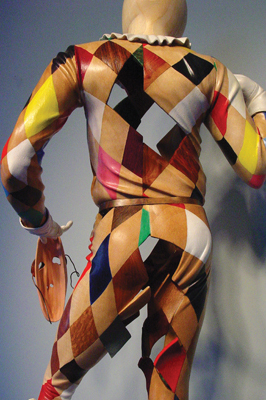 Further developing this technique, 'The Hollow Man' from this collection depicts Harlequin, a star of the past who, beneath the costume, is non-existent. With his mask removed, he is faceless; as his costume falls apart, he is hollow. Ian Norbury is not afraid to experiment, and even though one can see straight through The Hollow Man's composite body, the illusion is not shattered, as there are no cheap tricks to be revealed. As well as male jesters, the female figure is a speciality of Norbury's work and Paradise of Fools includes five exceptionally crafted female nudes, each with their own story of folly drawn from Roman and Greek mythology, the Bible and classical antiquity. Norbury mixes timbers to great effect, a technique that is oddly taboo among some traditionalists. "There seems to be almost animosity towards the idea," he says. "It's the same with painting carvings - it's about as traditional as you can get but the traditionalists hate it." 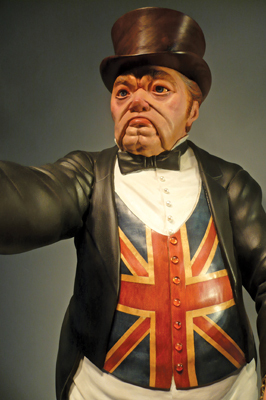 'Europhobia' - Norbury's take on the 'John Bull' character, satirising the bigoted 'Little England' mentality - makes use of lime (Tilia vulgaris), boxwood (Buxus sempervirens), yew (Taxus baccata) and dyed maple (Acer campestre), as well as veneer, pearl, amber and acrylics. There is seemingly no limit to his material choice; as well as a great many wood species, Paradise of Fools makes use of gold, silver, copper, marble, crystal glass, tiger's eye - Norbury goes into each piece with an open mind and mixing media is key to his innovative style. 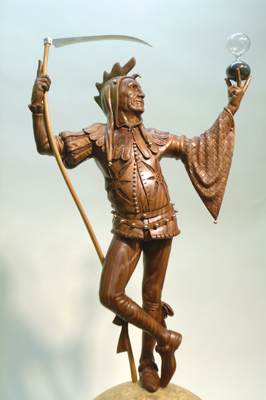 Of the 19 sculptures, only one is composed purely of wood; the wall-mounted head and chin-stroking hand of 'Puck' - Shakespeare's 'shrewd and knavish sprite' from A Midsummer Night's Dream, which is carved entirely from lime. Most pieces take about three weeks, though some can take up to three months. His working method for such a collection is methodical: "I decide on a theme for the exhibition. I work on one piece at a time. I make an initial drawing and then produce the various views anatomically. I do not use models. 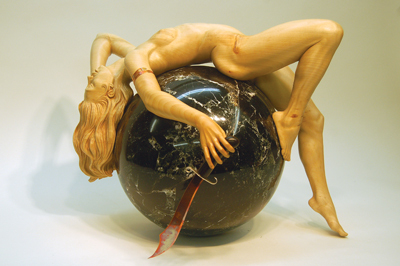 The figure is bandsawn from two sides, carved, sanded, polished and mounted. Then I move on to the next piece." Despite his carving prowess, it is not the process of carving that excites him: "The best aspect of carving is the conception - the burst of enthusiasm for the idea. The rest of the work is mostly very tedious, and it's usually unsatisfactory at the end." Though many would beg to differ. Influence "I don't know much about other carvers," says Norbury, "I admire old German boxwood carvings and I suppose Grinling Gibbons shows you that sticking lots of bits of wood together can produce a good carving." An accomplished painter, Norbury's influences seem to stem more from other art forms, and it isn't much of a surprise when he cites Salvador Dali­ as an initial inspiration. Elaborating on Dali's "combination of technical perfection and an enigmatic theme" in particular, the influence seems to have stuck with him throughout his career. He also names the Mexican surrealist Remedios Varo, and surreal characteristics remain prevalent in Ian Norbury's work. 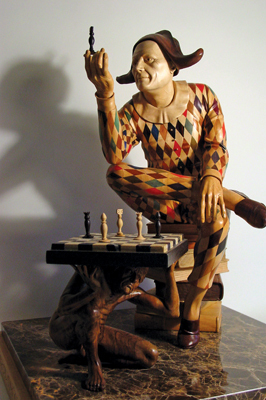 For example, in the piece 'Reflections', a clown and a wealthy businessman stand upon a marble checkerboard floor, facing each other on either side of a piece of glass. 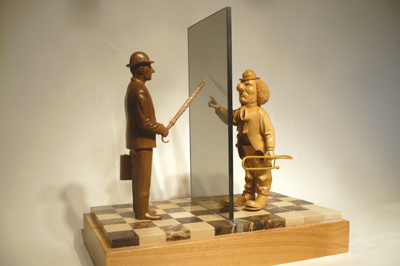 The glass can be seen as both a mirror, in which the boxwood clown and the walnut businessman face their own reflections with dissatisfaction; and a window to each figure's wish. The clown, a poor figure of ridicule, longs to be wealthy and respectable; the dull, straight-laced businessman yearns to be amusing and irresponsible. Paradise of Fools was Ian Norbury's first exhibition in several years and will, most likely, be his last. "I will still be carving; my clients would be very unhappy if I stopped," he assures us, but after years as one of the world's most in-demand carving tutors, he is now likely to also retire from teaching. That said, Ian Norbury has written books on the subject and also has many video tutorials available for purchase online that he will continue to add to, so there's still much to learn from one of the acclaimed carvers of our time. 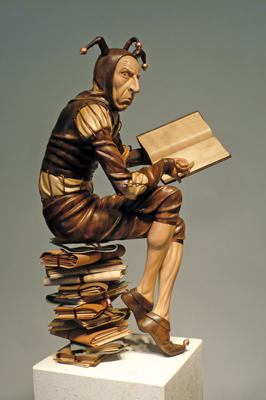 Ian Norbury's work raises the question of woodcarving's definition on the much-debated boundary between art and craft. His work is the result of masterful craftsmanship and technical innovation combined with well-considered characters, references and narratives that invite contemplation: "Obviously carving is craft," he says, "but whether it is also an art is difficult to say. Grinling Gibbons was considered one of the finest artists of his day. But now you do not need craftsmanship to become an artist. Is sticking a dead cow in a tank of formaldehyde art? It isn't craft. If it is art, I do not want to be an artist. I make things that people like - that is it."